Small volumes of anti-H3K4me3 antibody vial(s) may occasionally become entrapped in the seal of the product vial during shipment and storage. If necessary, briefly centrifuge the vial on a tabletop centrifuge to dislodge any liquid in the container`s cap. Certain products may require to ship with dry ice and additional dry ice fee may apply. 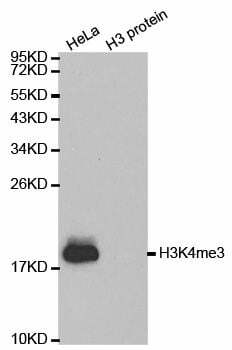 Western blot analysis of extracts of various cell lines, using TriMethyl-Histone H3-K4 antibody. 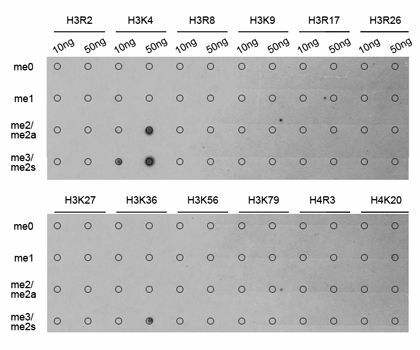 Dot-blot analysis of all sorts of methylation peptides using TriMethyl-Histone H3-K4 antibody. 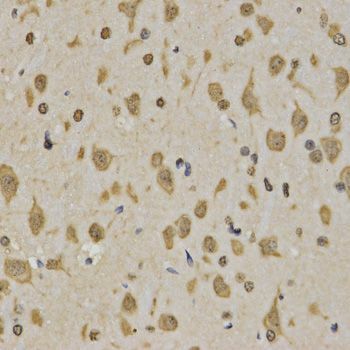 Immunohistochemistry of paraffin-embedded rat brain using TriMethyl-Histone H3-K4 antibody at dilution of 1:200 (40x lens). 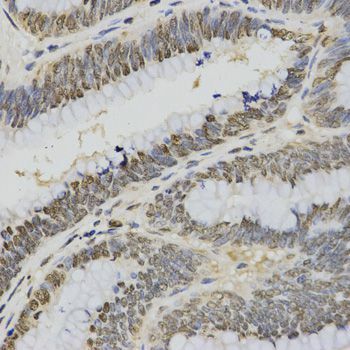 Immunohistochemistry of paraffin-embedded human rectal cancer using TriMethyl-Histone H3-K4 antibody at dilution of 1:200 (40x lens). Immunofluorescence analysis of 293T cells using TriMethyl-Histone H3-K4 antibody. Blue: DAPI for nuclear staining. 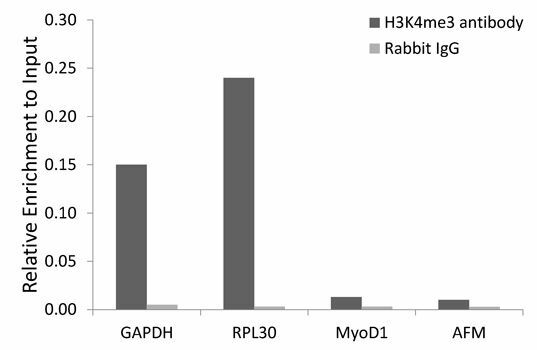 Chromatin immunoprecipitation analysis extracts of 293 cell line, using TriMethyl-Histone H3-K4 antibody and rabbit IgG. The amount of immunoprecipitated DNA was checked by quantitative PCR. Histogram was constructed by the ratios of the immunoprecipitated DNA to the input. NCBI/Uniprot data below describe general gene information for H3K4me3. It may not necessarily be applicable to this product. HIST3H3: Core component of nucleosome. Nucleosomes wrap and compact DNA into chromatin, limiting DNA accessibility to the cellular machineries which require DNA as a template. Histones thereby play a central role in transcription regulation, DNA repair, DNA replication and chromosomal stability. DNA accessibility is regulated via a complex set of post-translational modifications of histones, also called histone code, and nucleosome remodeling. The nucleosome is a histone octamer containing two molecules each of H2A, H2B, H3 and H4 assembled in one H3-H4 heterotetramer and two H2A-H2B heterodimers. The octamer wraps approximately 147 bp of DNA. Expressed in testicular cells. Belongs to the histone H3 family.